The 1996 season was another long one for my wife Shari to endure. I spent a lot of time during the archery and shotgun season at my deer camp located two hours away from our home. We have two small children Rachel 4 and Erica 2. Being away can be hard on the family and didn't allow Shari to get much shopping done. I hate to shop, but when the shotgun season winded down I promised Shari that I would go Christmas shopping with her the following Saturday. The week went by fast and we were set to go shopping the next morning as planned, until my buddy Jeff called Friday evening to coax me into bow hunting the next morning. At first I told him I couldn't go because of the promise I had mad to my wife. After I hung up, I kept thinking it would be the last opportunity of the season to hunt the trophy non-typical I saw in the area. With that in mind, it didn't take me long to devise a plan that would allow me to do both. I called Jeff back and told him to be at my house at 5:45 am, but that I wanted to be out of the woods by 9 am to go Christmas shopping. It was December 14th, the next to last day of the late archery season. Jeff arrived on schedule at 5:45 am. We would be hunting an area close to my home in Western New York. Jeff was not familiar with the area so while we were having our morning coffee I showed him a topographical map and an aerial photograph that detailed where we would be hunting. In early September I had trimmed shooting lanes and positioned two of my Loc -On tree stands in the area. I based my stand placement on sightings of the big buck during the 1995 archery season and extensive scouting I conducted immediately following the season. Once we arrived at the hunting area I led Jeff in the darkness to the portable stand where I'd seen several does, and passed on a spike and a 4-pointer during early archery. 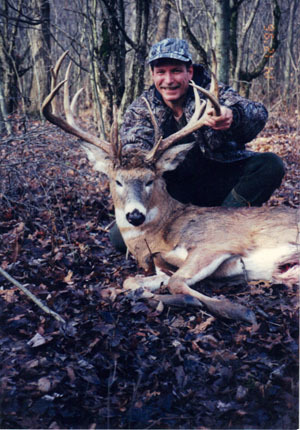 The location i would be hunting was at the edge of a thicket corridor close to the area where i took a 6-point buck during the 1995 archery season. As I prepared to ascend the tree to my stand, I placed liberal amounts of "Doe-in Heat" at the end of three of my shooting lanes. The primary rut had been over for about a month and I thought that any does that were not successfully bred during that time might be coming into estrus. It was still dark as I began to make a series of 10-15 aggressive short grunts. I turned my head slowly as I called to simulate a buck chasing a doe. This technique had lured the big non-typical into clear view during the 1995 archery season, but I could not get him in close enough for a shot. As it began to get light my confidence was not at its highest level. It was late archery season and I had not seen a deer from this stand while shotgun hunting. Word of the big buck was out, because during the gun season there were hutners pressuring the area every day and the deer had stopped moving. Earlier in the year I spotted what I thought to be the non-typical from a distance, but the buck was too far away to be sure. Although I did not hear of anyone taking a big non-typical in the area, I was unsure that he was still on the hoof. I shoot an Oneida Aero Force set at 62 lbs., with 65 percent let off, in combination with 28" Easton (2312) ultra light arrows fletched with feathers and tipped with 100 grain Thunderhead broad heads. I eliminated all but one crosshair on my PSE RS florescent sight, which I find keeps the sight picture open and less confusing. My Oneida bow shoots ultra fast and flat allowing me to be on target with one crosshair out to 30 yards. I was just after sunrise when I let off what would be my fourth series of short grunts. I was scanning the area when I caught movement in the hardwoods to my right. My whole body rushed when I saw a giant buck quartering toward me about 100 yards out. I knew it had to be the huge non-typical I saw the year before, his rack appearing ivory white and even larger now. I slowly stood up, nudged the folding seat to the closed position and got ready for a shot. I imagined this scenario many times before, but now that it was actually happening I was having great difficulty maintaining my composure. I told myself not to look at his rack and just focus on his chest. I knew he was heading for the thicket, but would he pass close enough for a shot? He was angling in the wind and when he was about 40 yards away he stopped, raised his head and flared his nostrils to test the air. He did not wind me because his nose went back to the ground and he was on the move again angling right toward me. As he passed the first scent area he slowed and then came to an abrupt stop in the middle of my second shooting lane only 17 yards away. I knew I had to shoot fast because he was acting spooky as he smelled the ground where I had placed scent. The buck offered a front quartering shot, and with his head still down, I drew back my Oneida bow and placed my crosshairs on his chest. For a split second his left antler screened his vitals, but when he turned his head slightly I had an open shot and quickly released. From the sound of the arrow, I was pretty sure he was hit, but I was concerned it was a gut shot because of the angle. The buck bolted along the edge of the thicket away from me, then circled to the left, crashing through the thicket directly in front of me until he stumbled and went down. I was so excited and shaky I was having trouble nocking another arrow. The huge bucks neck and rack thrashed back and forth for several seconds before going still. My knees were like rubber as I stared in awe at the magnificent giant that lay within sight. My whole body was quivering so bad that I decided I had better sit down. After ten minutes of no movement from the buck, I climbed down from my stand, grabbed hold of his rack and counted the points. Nine on one side and eight on the other, 17 total points! My arrow had entered just above the center of his chest and completely exited on a downward angle through his paunch. The buck's body was so large I had difficulty maneuvering him into position to dress him out. As I dressed him I determined my arrow had caught both lungs, blew through the liver and passed through his guts. His entrails formed a mound twice the size I had seen before. When I was finished I looked at my watch and it was 8:35 am. I didn't want to disturb my buddy Jeff's last day of hunting, so I decided to wait until around nine o'clock before I excitedly jogged and speed walked through the woods to Jeff's stand. When I first told him the story, he thought I was pulling his leg, but after he saw how excited I really was he finally believed me. It was close to 1:00 pm by the time we dragged the huge buck out of the woods and back to my home. After that great experience, the last thing I felt like doing was Christmas shopping. However, I did go as promised, but my wife and I did not get started until 3:30 that afternoon. That evening I spent most of my time on the phone calling my friends and telling the story of the monster buck I had taken. The next day I had steams of visitors who came to my home throughout the day to admire the great buck and take photographs. My friends and I had little experience scoring racks, but using a Boone & Crockett score sheet we made several attempts and kept coming up with incredible non-typical scores over 200. To prevent any false rumors and to ensure proper credit, at my request, Jim Rogers, a conservation officer with the DEC, came out to verify the archery kill through visual examination of the buck and chemical analysis of the wound site. Dressed out the buck weighed 200 lbs. and was estimated by the DEC to be only 3 1/2 years old, with a live weight of 250-260 lbs. After the 60 day drying period the rack was officially panel scored by Boone & Crockett measurers Dale John, Robert Turk and David Piazza. The panel came to a final non-typical score of 205-1. The score breaks the non-typical NYS Big Buck Club archery record of 191, which had stood up for 9 years. In addition, it is the largest non-typical ever taken in Erie County with gun or bow.